When the new S&P+ rankings come out, it’s time for football. On Monday, SB Nation’s Bill Connelly released his annual preseason rankings. A predictive metric, S&P+ looks at three factors—recent history, returning production, and recruiting—to try and project how successful each FBS program will be in the coming season. I’ve found that getting a little weird predicts pretty well. This number isn’t a strict five-year average — last year’s ratings already carry heavy weight from the returning production piece. Instead, what you see below is a projection based solely off of seasons two to five years ago. Recent history doesn’t carry much weight in the projections, but it serves as a reflection of overall program health. We overreact to one year’s performance sometimes. I take each team’s returning offensive and defensive production (which are on different scales) and apply projected changes to last year’s ratings. The ranking you see below is not where they rank in returning production but where they would rank after the projected changes are applied to last year’s S&P+ averages. This piece makes up a vast majority of the overall S&P+ projections. I create a rating based on these weighted four-year recruiting rankings. The weighting (67 percent this year’s class, 15 percent last year’s, 15 percent the year before that, three percent the year before that) is based on what makes the ratings most predictive. 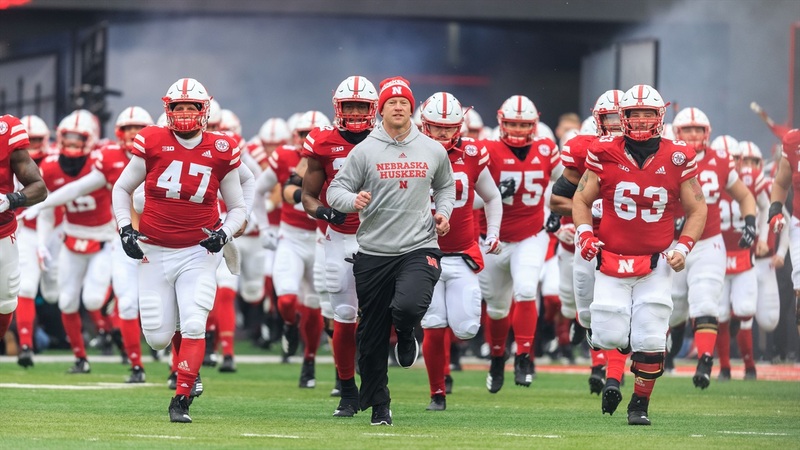 If you read Hot Reads every morning then, by now, you know that Nebraska ranked 39th in the country in the “recent history” part of the equation, 93rd in the country in returning production, and 20th nationally in the four-year recruiting rankings. So, for Nebraska, that all that adds up to. . .
By S&P+, the Huskers are ranked 45th and projected at just a shade under a touchdown better than the average opponent (how the S&P+ number can be read). Here’s how the entire Big Ten stacks up. >> Thoughts and prayers, Rutgers. TEAM Rec. Impact Ret. Production 5YR Avg. >> We don't need to rehash the last five years of Nebraska football, the standing is pretty self-explanatory, but the returning production is worth a discussion. Broken down by sides of the ball, Nebraska returns 59 percent of its offensive production and 55 percent of its defensive production from last year. Those percentages rank 79th and 94th, respectively. Every returning statistic is weighted. On offense, receiver yards mean the most, followed by passing yards, rushing yards and offensive line starts. On defense, defensive back tackles and passes defensed mean the most, followed by overall tackles and PDs, defensive back tackles for loss, overall TFLs, linebacker TFLs, linebacker tackles and linebacker PDs. Continuity on the offensive line represents the weakest correlation, Connelly has found. And Nebraska returns very little behind its defensive line. All of the team's top six tacklers a season ago resided at the linebacker or safety spot. Five of them are gone. One of them, senior linebacker Luke Gifford, also led the team in tackles for loss. Corner Dicaprio Bootle returns after a team-best 15 pass break-ups in 2018, but each of the top three safeties are gone. It's an imperfect way of looking at things—Michigan State had more returning production entering 2018 than any other program and parlayed that into a 7-6 season—but it's important nonetheless. I think one of the major reasons it isn't dragging Nebraska down is because. . .
>> This offense projects to be really, really good, even after losing a 1,000-yard rusher and receiver. Recruiting factors in here, as Nebraska stocked up the cupboard a bit more in the dynamic weapon department, but Nebraska has Adrian Martinez at quarterback and J.D. Spielman at wideout and (maybe) Maurice Washington at running back and Scott Frost on the sideline calling plays. That adds up to the 35th-best offense, per Connelly's projection. So the Huskers are projected to have the second-best offense in the Big Ten West. Feels about right. Wisconsin still has a dominant offensive line (though it just lost a major piece), a dominant running back and not-so-bad problem at quarterback. Play the stud freshman or the senior? The offense with the senior running the show was still ranked No. 12 by S&P+ in 2018. Nebraska getting a bump from No. 42 at the end of last season to No. 35 this preseason shows, I think, the respect for Martinez's and Spielman's numbers and the projected impact of some of the freshmen coming in. >> The Big Ten has six teams in the S&P+ top-25, the second-best average amongst the conferences and the second-best improvement over last year’s average. Which all falls right in line with what we think about the conference as a whole—it’s getting better. But, Nebraska’s schedule got easier. In 2018, Nebraska faced seven teams that finished inside the final top-50 by S&P+. The Huskers played four of those—all top 25 teams—on the road. In 2019, they only play five top-50 teams, with four coming at home, including each of the big three (Ohio State, Wisconsin, Iowa). >> Minnesota sticks out like a sore thumb at No. 33, but it probably shouldn't. PJ Fleck got the boat rocking late in 2018. Plus, the Gophers return more offensive production than all but three FBS teams and more overall production than all but nine FBS teams. Fleck's bunch was young last season all across the board but closed out the campaign with four wins in their last six games, blew out Wisconsin to get bowl eligible and then rolled over Georgia Tech in the Quick Lane Bowl. The running game looked scary good over the back half of the season. >> It seems like no one really knows what to make of Purdue, not even Connelly. Jeff Brohm has built his name on offense and the Boilermakers are 124th in returning offensive production. But they just signed their best recruiting class since 2004. But the road schedule is loaded with tough matchups. Most expect Purdue to continue to ascend in Brohm’s third season, but I’d venture to say no one knows what success in 2019 will look like or mean. So coming in right smack dab in the middle feels about right. >> There has been a good deal of Connelly bashing over a perceived SEC bias in the rankings. Where "it just means more," there are currently six top-10 teams by S&P+ and 10 top-21 teams. Alabama, Georgia and LSU occupy spot Nos. 1, 2 and 4. But before you go dismissing these rankings, there was an adjustment made this season and the SEC's projected average dropped half a point from 2018. And 2018 SEC had arguably one of the best top-to-bottom seasons in some time. In the final 2018 rankings, SEC schools occupied six of the top nine spots and the lowest-ranked program checked in at No. 53. Given 13 of the 14 schools ranked inside the top-50 in returning production (a number no one can claim bias on) and 11 of the 14 were in the top-25 for recruiting impact, it stands to reason this S&P+ concoction is going to spit out some friendly numbers for those in SEC country. At this point, as long as Nick Saban is in Tuscaloosa and Alabama continues to have the No. 1 recruiting class eight times every nine years, predictive metrics are going to favor the Tide in the preseason. That will always help the SEC.